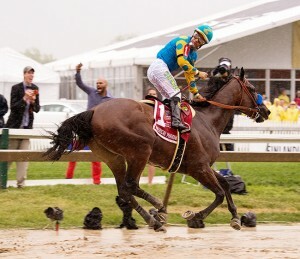 American Pharoah Extends Empire in Preakness Stakes: Another Triple Crown is on the line this year, as American Pharoah won the Preakness (GI) at Pimlico and heads to Belmont Park in three weeks with a chance at making history. With this win, American Pharoah keeps his perfect 2015 record alive with four wins out of four starts. 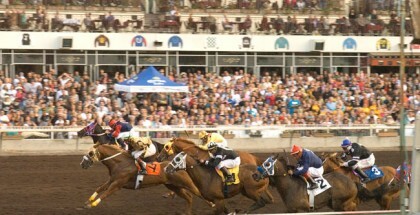 Last minute rain added an extra element to the race and made the track sloppy. American Pharoah did not mind the wet conditions at all, although the major obstacle came from his former stablemate. To win the Preakness, American Pharoah had to overcome a seemingly vicious early pace duel. Mr. Z was sent after the lead early, but jockey Victor Espinoza did not wish to get stuck behind horses in the rain and made sure American Pharoah secured his position on the lead. Dortmund and Divining Rod chased just behind, while Firing Line was not himself and ran at the back near Tale of Verve and Danzig Moon. On the far turn, American Pharoah put away Mr. Z, while Divining Rod made his rally. From way back, Tale of Verve obviously enjoyed the fast pace and rain, and began to make a furious move with Joel Rosario aboard. But American Pharoah, who won the Rebel (GII) earlier in the year on a sloppy track, enjoyed the rain too and drew clear of his opponents. Tale of Verve could only manage second against the “mortal” horses and Divining Rod held third. Dortmund finished a disappointing fourth, perhaps not liking the sloppy going. 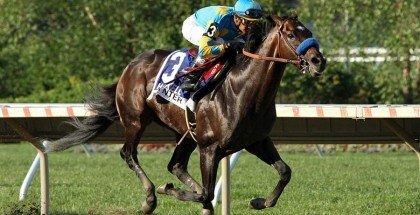 Trainer Bob Baffert kept his undefeated streak alive with his Derby winners that started in the Preakness. 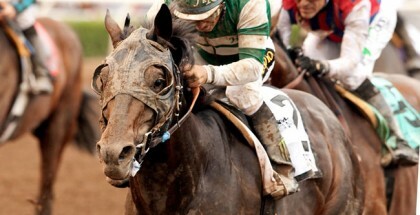 He won the Preakness before with Silver Charm, Real Quiet and War Emblem, who each entered the Belmont Stakes three weeks later with the same chance to win the Triple Crown. All of them failed, although Real Quiet was extremely close and only nosed out by Victory Gallop in 1998. Silver Charm finished second to Touch Gold in 1997. On a side note about the second place finisher Tale of Verve, after his connections were ridiculed for wanting to try the Kentucky Derby, he redeemed the faith trainer Dallas Stewart and owner Charles Fipke placed in him with his good runner-up finish at 28/1 odds. Also, third place finisher Divining Rod did not disgrace himself either and ran well for Lael Stables, who were stricken with tragedy in 2006 when Barbaro suffered an injury that later proved fatal. A son of the ultimate sire Tapit and multiple stakes winner Precious Kitten, he will prove a force to be dealt with down the line in future three-year-old events. American Pharoah paid $3.80 to win, $3.40 to place and $2.80 to show. Tale of Verve paid $19.00 to place and $8.80 to show, and will surely show up in three weeks as long as he remains healthy. Divining Rod paid a somewhat generous $5.20 to show. The trifecta was generous as well, paying $246.25 for 50 cents because the two other popular choices, Dortmund and Firing Line, failed to hit the top three. The ruler of three-year-olds American Pharoah answered every question so far. He can pass horses or win on the lead. The rain does not bother him, nor does a fast track. Now, the son of Pioneerof The Nile must answer the question that many other Derby/Preakness winners before him failed to deliver on. American Pharoah needs to win a 12 furlong race to complete his Triple Crown bid successfully.